Identification: Hyla cinerea is a large hylid (treefrog) with a SVL (snout-vent length) of 32-64 mm (1.25-2.5 in) (Conant and Collins, 1998). The dorsal color of adult frogs ranges from bright green, to nearly yellow, or even a dull greenish- or slate-gray (Ashton and Ashton, 1988; Conant and Collins, 1998). Most, but not all, individuals have a white or yellow, lateral stripe that varies in length (Duellman and Schwartz, 1958; Conant and Collins, 1998; Powell et al., 1998). Unlike Hyla gratiosa, the barking treefrog, the skin is not granular and the light stripe on the lip can be absent or often vaguely defined (Powell et al., 1998). Small, light dorsal spots or flecks may be present on some individuals (Dundee and Rossman, 1989; Conant and Collins, 1998; Powell et al., 1998). Like many arboreal hylids they have toepads (disks) for climbing (Conant and Collins, 1998; Powell et al., 1998). The calls of males are a continuous, nasal "queenk-queenk-queenk" (Ashton and Ashton, 1988; Conant and Collins, 1998). Recordings of the calls of H. cinerea are available on CDs by Elliott (1994), Library of Natural Sounds (1996), Bogert (1998), and Rivero (1998). The tadpoles are green with a yellow or white stripe extending from each nostril to the eye (Ashton and Ashton, 1988), and may have mottled tail fins (Dundee and Rossman, 1989). Identification can be made confusing by the fact that green treefrogs occasionally hybridize with Hyla gratiosa; the resulting hybrids exhibit an intermediate suite of characteristics (Dundee and Rossman, 1989; Bogert, 1998; Conant and Collins, 1998). See the species account titled Hyla gratiosa LeConte, 1857 "1856" on this website. Green treefrogs have been illustrated by a variety of authors (Duellman and Bell, 1955; Wright and Wright, 1949; Smith, 1961; Mount, 1975; Johnson, 1977, 1987, 2000; Ashton, 1978; Smith, 1978; Behler and King, 1979; Martof et al., 1980; Garrett and Barker, 1987; Ashton and Ashton, 1988; Black and Sievert, 1989; Dundee and Rossman, 1989; Lazell, 1989; Carmichael and Williams, 1991; Elliott, 1994; Bogert, 1998; Conant and Collins, 1998; Powell et al., 1998; Rivero, 1998; Bartlett and Bartlett, 1999a, b; Phillips et al., 1999; Minton, 2001). Native Range: Hyla cinerea is indigenous to Delaware and the entire Delmarva peninsula, southern and eastern Maryland, eastern Virginia, the Costal Plains in the states of North Carolina, South Carolina, Georgia, Alabama, all of Florida including some of the Keys, the lower Mississippi Valley and surrounding states of Mississippi, Louisiana, eastern, south and central Arkansas, southeastern Missouri, southern Illinois, western Tennessee and Kentucky, eastern Texas, and portions of southeastern and extreme east-central Oklahoma (Duellman and Bell, 1955; Martof, 1956; Duellman and Schwartz, 1958; Smith, 1961; Lee, 1969; Harris, 1975; Mount, 1975; Stevenson, 1976; Johnson, 1977, 2000; Martof et al., 1980; Lohoefener and Altig, 1983; Tobey, 1985; Garrett and Barker, 1987; Ashton and Ashton, 1988; Moler, 1988; Black and Sievert, 1989; Carpenter and Krupa, 1989; Dundee and Rossman, 1989; Lazell, 1989; Carmichael and Williams, 1991; Gibbons and Semlitsch, 1991; Conant and Collins, 1998; Bartlett and Bartlett, 1999a, b; Duellman and Sweet, 1999; Phillips et al., 1999; Dixon, 2000; King, 2000; Meshaka et al., 2000; Seigel et al., 2002, Tucker et al., 2006). Minton (2001) suggests H. cinerea may eventually be discovered in Posey County, extreme southern Indiana, because an adjacent population occurs across the Ohio River in Henderson County, Kentucky (Lodato and Grannan, 1990). Potentially, H. cinerea may exist in Mexico, along the Rio Grande River, adjacent to populations in Texas (Smith and Dixon, 1987; Smith and Smith, 1993). Table 1. States with nonindigenous occurrences, the earliest and latest observations in each state, and the tally and names of HUCs with observations†. Names and dates are hyperlinked to their relevant specimen records. The list of references for all nonindigenous occurrences of Hyla cinerea are found here. Means of Introduction: The H. cinerea found in Massachusetts was brought in on a shipment of plants (Cardoza et al., 1993). The origin of the population of H. cinerea in Camden County, Missouri, was not stated (Johnson, 1987, 2000), but their association with aquaculture suggests that tadpoles could have been brought into the farming operation accidentally. The same mode of transport is probably true for the green treefrogs introduced to Douglas County, Kansas (Collins, 1993). The origin of the H. cinerea in Tulsa, Oklahoma, is unknown (B. Olsen, personal communication 2002) but they could have been brought in on ornamental plants added to Mohawk Park. Conant (1977) postulated that H. cinerea could have been imported into Cameron County, Texas, for the pet trade. Status: The H. cinerea in Massachusetts was collected; they are not established in this state (Cardoza et al., 1993). The green treefrog population in Camden County, central Missouri, is established but remains confined to the private fish farm (Johnson, 2000). The H. cinerea in Kansas have not been found since 1975, and were extirpated by cold winter weather (Collins, 1993). The nonindigenous H. cinerea in Tulsa, Oklahoma, have not been seen in more than a decade and as of 2002 are extirpated (B. Olsen, personal communication 2002). The well-established populations of H. cinerea in Cameron County, Texas, are now regarded as indigenous (Conant and Collins, 1998; Dixon, 2000), and can be found in nearby Hidalgo County, bordering the Rio Grande River (Dixon, 2000). Perhaps preexisting populations of H. cinerea in Cameron County were augmented by introductions. The status of green treefrogs in Puerto Rico is unclear (Rivero, 1998). A variety of authors list H. cinerea as established in its limited area of introduction (Frost, 1985; Schwartz and Henderson, 1985, 1991; Conant and Collins, 1998; Hedges, 1999; Thomas, 1999); however, Rivero (1998) claims, "no specimen has been seen for years." Impact of Introduction: Green treefrogs have had no impact on those areas in which they were not established (Massachusetts), or temporarily established (Kansas and Tulsa, Oklahoma). The H. cinerea confined to the fish farm in Camden County, Missouri, have not spread from this anthropogenic habitat (Johnson, 1987, 2000); thus, they cannot have an impact on indigenous ecosystems. The nonindigenous population of H. cinerea on Puerto Rico, should have had little impact on indigenous wildlife as they remained confined to their original area of introduction and currently could be extirpated (Rivero, 1998). Remarks: The taxonomy of H. cinerea has been reviewed or summarized by Duellman and Schwartz (1958), Frost (1985, 2000), and Duellman and Sweet (1999). Several authors have reviewed the natural history of green treefrogs (Wright and Wright, 1949; Duellman and Bell, 1955; Duellman and Schwartz, 1958; Ashton and Ashton, 1988; Gibbons and Semlitsch, 1991; Dundee and Rossman, 1989; Conant and Collins, 1998; Johnson, 2000). Scientific and standard English names follow Crother (2008). Green treefrogs are arboreal hylids that prefer willow clumps along waterways, mesic hammocks with ponds or lakes, and cypress swamps, while avoiding mangrove swamps and salt marshes (Duellman and Schwartz, 1958; Dundee and Rossman, 1989). Hyla cinerea occasionally enters brackish water (Conant and Collins, 1998). They typically utilize leaves, crevices, eaves of buildings, the undersides of bark or logs, axils of palm fronds, shaded branches, or any vertical surface for retreats (Duellman and Schwartz, 1958; Dundee and Rossman, 1989). Their diet includes insects, snails, and spiders (Dundee and Rossman, 1989). Unlike many other North American hylids, they may call from their perches in the absence of rain (Gibbons and Semlitsch, 1991; Conant and Collins, 1998). Normally, H. cinerea mates in spring, summer, or as late as October in the far South (Duellman and Schwartz, 1958; Dundee and Rossman, 1989; Conant and Collins, 1998; Johnson, 2000). From 340 to 500 eggs are laid as floating masses of 5 to 40, attached to vegetation at the water surface (Wright and Wright, 1949; Ashton and Ashton, 1988; Dundee and Rossman, 1989). Tadpoles take about 2 months to metamorphose (Wright and Wright, 1949; Ashton and Ashton, 1988; Dundee and Rossman, 1989). Ashton, R. E., Jr. 1978. Identification manual to the amphibians and reptiles of Florida. Florida State Museum Associates, University of Florida, Interpretation Series (1):[1-41]. Ashton, R. E., Jr., and P. S. Ashton. 1988. Handbook of Reptiles and Amphibians of Florida. Part Three. The Amphibians. Windward Publishing, Inc., Miami. 191 pp. Black, J. H., and G. Sievert. 1989. A Field Guide to Amphibians of Oklahoma. Nongame Wildlife Program, Oklahoma Department of Wildlife Conservation, Oklahoma City. 80 pp. Bogert, C. M. 1998. Sounds of North American Frogs. The Biological Significance of Voice in Frogs. Smithsonian Folkways Recordings, Washington, D.C. Audio CD Recording. Brown, B. C. 1950. An Annotated Check List of the Reptiles and Amphibians of Texas. Baylor University Studies, Waco. 259 pp. Collins, J. T. 1993. Amphibians and Reptiles in Kansas. Third Edition, Revised. Museum of Natural History, The University of Kansas, Lawrence. 397 pp. Conant, R. 1977. The Florida water snake (Reptilia, Serpentes, Colubridae) established at Brownsville, Texas, with comments on other herpetological introductions in the area. Journal of Herpetology 11(2):217-220. Duellman, W. E., and L. N. Bell. 1955. The frogs and toads of the Everglades National Park. Everglades Natural History 3(2):102-113. Duellman, W. E., and A. Schwartz. 1958. Amphibians and reptiles of southern Florida. Bulletin of the Florida State Museum, Biological Sciences 3(5):181-324. Duellman, W. E., and S. S. Sweet. 1999. Distribution patterns of amphibians in the Nearctic Region of North America. Pp. 31-109. In: W. E. Duellman (editor). Patterns of Distribution of Amphibians. A Global Perspective. The Johns Hopkins University Press, Baltimore. 633 pp. Elliott, L. 1994. The Calls of Frogs and Toads. NatureSound Studio, NorthWood Press, Inc., Minocqua, Wisconsin. Audio CD Recording. Ernst, C. H., S. C. Belfit, S. W. Sekscienski, and A. F. Laemmerzahl. 1997. The amphibians and reptiles of Ft. Belvoir and northern Virginia. Bulletin of the Maryland Herpetological Society 33(1):1-62. Frost, D. [R.] (compiler). 2000. Anura­—frogs. Pp. 6-17. In: B. I. Crother (chair), and Committee on Standard English and Scientific Names (editors). Scientific and standard English names of amphibians and reptiles of North America north of Mexico, with comments regarding confidence in our understanding. Society for the Study of Amphibians and Reptiles Herpetological Circular (29):i-iii, 1-82. Harris, H. S., Jr. 1975. Distributional survey (Amphibia/Reptilia): Maryland and the District of Columbia. Bulletin of the Maryland Herpetological Society 11(3):73-167. Hedges, S. B. 1999. Distribution patterns of amphibians in the West Indies. Pp. 211-254. In: W. E. Duellman (editor). Patterns of Distribution of Amphibians. A Global Perspective. The Johns Hopkins University Press, Baltimore. 633 pp. Joglar, R. L. 1998. Los Coquíes de Puerto Rico. Su Historia Natural y Conservación. Editorial de las Universidad de Puerto Rico, San Juan. 232 pp. Johnson, T. R. 1977. The amphibians of Missouri. University of Kansas Museum of Natural History Public Education Series (6):i-x, 1-134. Johnson, T. R. 1987. The Amphibians and Reptiles of Missouri. Missouri Department of Conservation, Conservation Commission of the State of Missouri, Jefferson City. 368 pp. King, F. W. 2000. Florida Museum of Natural History's Checklist of Florida Amphibians and Reptiles [online]. Available on URL: http://www.flmnh.ufl.edu/herps/FL-GUIDE/Flaherps.htm. Florida Museum of Natural History, University of Florida, Gainesville. Lazell, J. D., Jr. 1989. Wildlife of the Florida Keys: A Natural History. Island Press, Washington, D.C. 250 pp. Lee, D. S. 1969. The treefrogs of Florida. Florida Naturalist 42(3):117-120. Library of Natural Sounds. 1996. Voices of the Night. The Calls of the Frogs and Toads of Eastern North America. Cornell Laboratory of Ornithology, Ithaca. Audio CD Recording. Lodato, M. J., and T. L. Grannan, Jr. 1990. Geographic distribution: Hyla cinerea (green treefrog). USA: Kentucky: Henderson Co. Herpetological Review 12(2): 37. Meshaka, W. E., Jr., W. F. Loftus, and T. Steiner. 2000. The herpetofauna of Everglades National Park. Florida Scientist 63(2):84-103. Minton, S. A., Jr. 2001. Amphibians & Reptiles of Indiana. Revised 2nd Edition. Indiana Academy of Science, Indianapolis. 404 pp. Olsen, B. 2002. Personal communication—Reptile Keeper, Tropical American Rainforest Building, Tulsa Zoo, Tulsa, Oklahoma. Rivero, J. A. 1998. Los Anfibios y Reptiles de Puerto Rico. The Amphibians and Reptiles of Puerto Rico. Segunda Edición Revisada. Editorial de la Universidad de Puerto Rico, San Juan. 510 pp. + CD. Schwartz, A., and R. W. Henderson. 1985. A Guide to the Identification of the Amphibians and reptiles of the West Indies Exclusive of Hispaniola. Milwaukee Public Museum, Milwaukee. 165 pp. Schwartz, A., and R. W. Henderson. 1991. Amphibians and Reptiles of the West Indies: Descriptions, Distributions, and Natural History. University of Florida Press, Gainesville. 720 pp. Schwartz, A., and R. Thomas. 1975. A check-list of West Indian amphibians and reptiles. Carnegie Museum of Natural History Special Publication (1):1-216. Seigel, R. A., R. B. Smith, J. Demuth, L. M. Ehrhart, and F. F. Snelson, Jr. 2002. Amphibians and reptiles of the John F. Kennedy Space Center, Florida: A long-term assessment of a large protected habitat (1975-2000). Florida Scientist 65(1):1-12. Smith, H. M. 1978. A Guide to Field Identification. Amphibians of North America. Golden Press, New York. 160 pp. Smith, H. M., and J. R. Dixon. 1987 . The amphibians and reptiles of Texas: A guide to records needed for Mexico. Bulletin of the Maryland Herpetological Society 23(4):154-157. Smith, H. M., and A. J. Kohler. 1978. A survey of herpetological introductions in the United States and Canada. Transactions of the Kansas Academy of Science 1977 80(1-2):1-24. Smith, H. M., and R. B. Smith. 1993. Synopsis of the Herpetofauna of Mexico. Volume VII. Bibliographic Addendum IV and Index, Bibliographic Addenda II-IV, 1979-1991. University Press of Colorado, Niwot, Colorado. 1082 pp. Thomas, R. 1999. The Puerto Rico area. Pp. 169-179. In: B. I. Crother (editor). Caribbean Amphibians and Reptiles. Academic Press, San Diego. 495 pp. Tobey, F. J. 1985. Virginia's Amphibians and Reptiles: A Distributional Survey. Virginia Herpetological Society, Richmond and Purcellville. 114 pp. Tucker, J. K. , J. T. Lamer and C. R. Dolan. 2006. 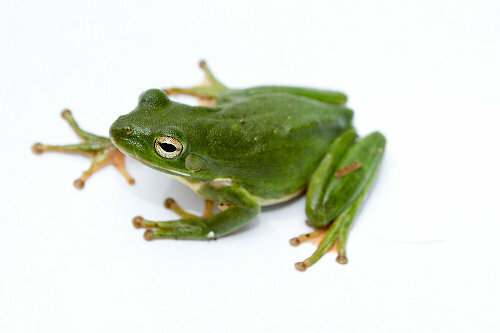 Hyla cinerea. Herpetological Review 37(4): 488. Wright, A. H., and A. A. Wright. 1949. Handbook of Frogs and Toads of the United States and Canada. Third Edition. Cornell University Press, Ithaca and London. 640 pp.